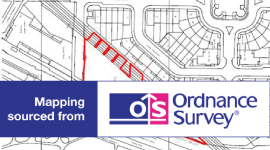 C. McILvar Ltd can provide Ordnance Survey Data Site Plans to submit with your planning application. These are available in either 1:200; 1:500; 1250; and 1:2500. C. McILvar Ltd can also provide scaled, detailed legal Transfer Land Maps for land transfers for your solicitor, bank and/or building society. Please get in touch with us to discuss your specific requirements.